This spring has just flown by like the American Goldfinch feeding in my garden. The birds go about their lives, following the flow of the seasons with no regard to timetables, calendars, deadlines and promises; my life this spring has been the complete opposite! I miss making my weekly blog posts. My camera has been in hand, both my SLR and my Smart phone too. I have taken many photos to share with you. The lotus bloom below is just a teaser for a future post, I have written in my head but no time to put to fingers to keyboard. There have been many projects that have taken my time since the first of the year, and most you already know about. My hubby and I started a one-truck trucking business, Chance of Rain Trucking ; I have teamed up with my sis-in-law as her media editor for her art rubber stamp company along with providing all the photos for her brand new webpage, Paper Parachute® ; and my Master Gardener™ group had the annual Spring Garden Fair in May. I have had several projects going on here at home: I am welcoming visitors to my garden next weekend so of course I had to take on several big projects in anticipation of this Open Garden. As I sit here looking out in my back yard, I can see the results of all that labor I have been doing since rainy March. I am looking forward to a relatively quiet summer now, with time to look thru the last years photos and work up some new art, and share with you all the things that have been rattling around in my head, waiting for an audience. The next few days I will put the finishing touches on my garden…. and begin again to make my weekly posts, because I miss it, and you. 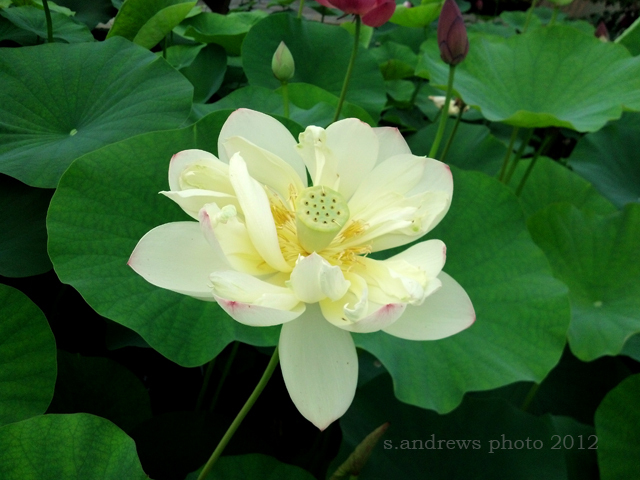 This entry was posted in in the garden, photography and tagged blog, garden, Green, lotus bloom, lotus flower, nature, plants, rubber stamp company, trucking business. Lovely picture! I’m sure your garden is quite lovely! I hope the show goes well for you! yes, it’s been very very busy at my house! looking forward to more down time, that’s for sure!